My little box of Avon goodies arrived a couple of days ago, containing my Suede Effect nail varnish and these two sparkly little delights. As I've mentioned before, my day and night look normally consists of just black liquid eyeliner but I'm trying to change that to add a bit more glitz to my look when I'm going out. 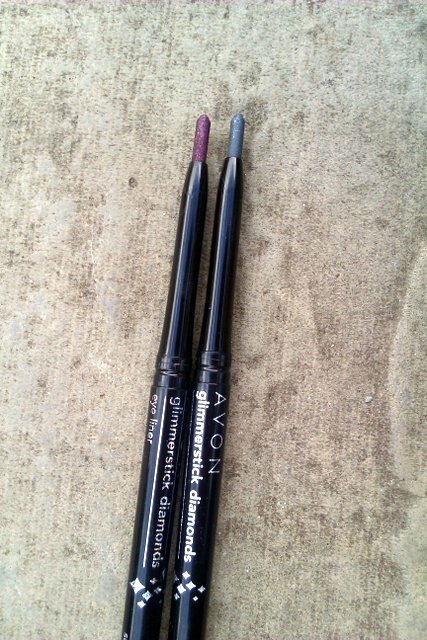 I'm off on a girly spa weekend with my best mate in Birmingham on Saturday as a birthday treat and to celebrate A-Level results, so got these Avon Glimmerstick Diamonds eyeliners to try out when we hit the town. 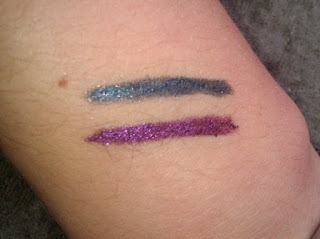 Unlike the 2True eyeliner I reviewed a couple of posts back, these Glimmerstick eyeliners aren't just a top coat of glitter to go over your everyday eyeliner. They are so much better. 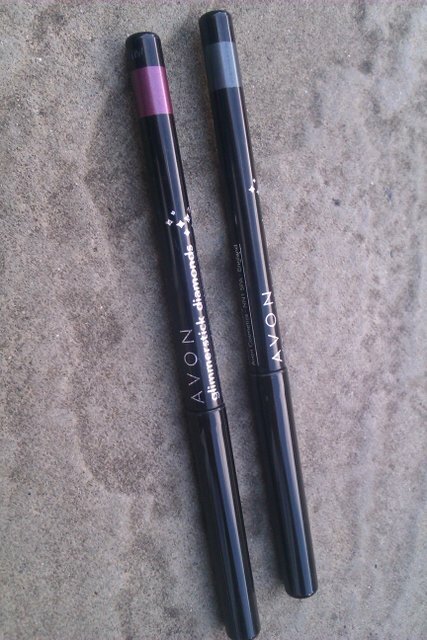 Instead of a wand-like applicator, they look a lot like a pen or crayon; I know that sounds strange but application is just as good as your usual eyeliner pencil. 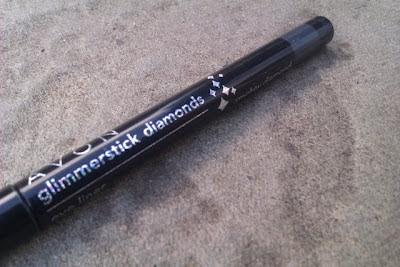 They work by twisting the eyeliner up, much like a lipstick, and then just simply applying to the top and of your eyelid and underneath your eye as normal. I got two of these Avon eyeliners, in 'Smokey Diamond' and 'Sugar Plum', partly because I couldn't pick between these gorgeous colours and partly because the price has been slashed from £6 to £2.99 each- bargain! 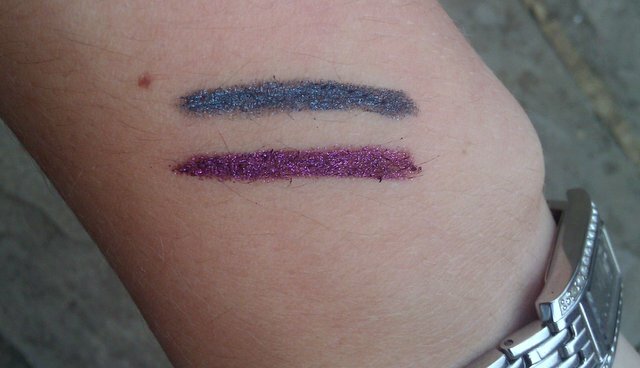 The eyeliners are a lot like a crayon in texture, apart from more silky; when applying it the stick just glides over your eye and is just so smooth and easy to do. Normally when I use ordinary black eyeliner pencil, the line is never spot-on (hence why I prefer liquid eyeliner) and it smudges so easily, but with these Glimmerstick Diamonds, the softness of the product makes it an absolute dream to apply. The actual colour is amazing too; the 'Sugar Plum' is a reddy-purple which isn't too dark and is perfect for making blue or green eye colours really pop, and the flecks of purple glitter catch the light perfectly. The 'Smokey Diamond' colour is equally as good, but I'd say it's more for evening wear. It's bluey-grey in colour, probably more blue than grey, and although it is a lovely colour, I was expecting more 'diamond', sparkly and silvery. The grey in the shade of blue though does create a really nice smokey eye effect without having to blend eyeshadows together, unlike the purple which just creates a shimmery pop of colour. The only downsides to this product is that they aren't very easy to blend unless you do it as soon as the product is applied. I guess this could also be a good thing though, meaning that despite the product's crayon-like, soft texture, it won't budge throughout the day or night. You also have to be really careful of snapping it- I know this sounds silly but because the product is so soft and malleable, if you twist it up that little bit too far it's going to break off! Apart from that, this is such an affordable-yet-fab product; the colours are gorgeous and warm, the glitter is well concentrated to maximise that glimmer effect even with the slightest of movements, and it is wonderfully soft and smooth to apply. 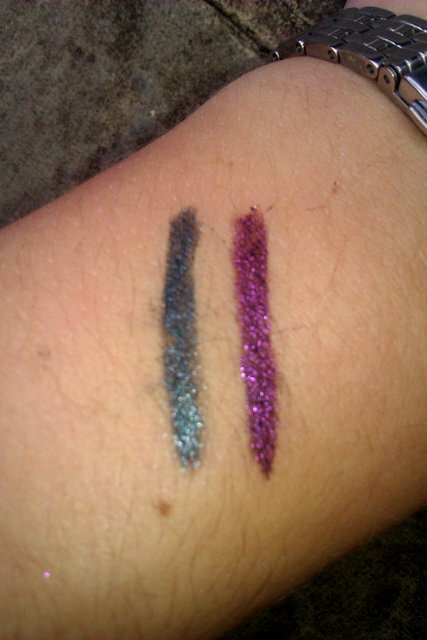 It's also available in 'Emerald Glow' (which looks equally amazing) and 'Black Ice'. I recommend you all buy it while it's still under £3!